Does anybody need a dog? This dog has to find a home soon. I can't have her stealing the food right off of Lola's plate like she just did. Last night, I heard a loud car door outside of my house. We were waiting on a friend to come and get Olivia and Noah, who were playing Wii at our house, and I opened the front door to check it out. There stood a little beagle. Someone dumped a dog off in my neighborhood. She was clean and smelled good, though she looked like she hadn't been fed recently at all. She was most interested in water, too, which was really sad. Clearly she was a pet and they either couldn't feed her anymore or they just quit feeding her. She's been fixed, so she's at least six months old. She's sweet and prefers to lay in Phillip's lap and sleep. She wasn't wild at all and didn't bark. We took care of her and she spent the night. The kids named her Ellie, and they love her. Clearly, Phillip adores her. I think she's sweet and like her, too. Our friends, Mandy and Neil, have a beagle named Jack, and this dog acts oddly similar to Jack. Slightly emo and trying to get into the trashcan but mild mannered otherwise. This morning when Phillip left for work, though, Ellie had a meltdown. She barked like a maniac, jumped all over everything and ran around constantly looking for him. What to do, what to do?????? If we find her a good home, then she'll go to a good home. If we don't, then I guess I am now the owner of a slightly emo beagle named Ellie. So I've compiled a short list of basic/household things that I can not live without. Parchment paper: Parchment paper is a must in any kitchen. Tear off a length to line your pans and it will be sooo easy to rinse them clean. Use it for the kids to play Moon Sand on to avoid a mess. Or at least a bigger mess than necessary. Disposable foil pans: An absolute must for bringing casseroles, dips or cakes to events when you don't mind a shabby pan. Also a must for cooking things that are hard to get out of the pan; just throw these away and save yourself the trouble of cleaning the pan. Good paper towels: That commercial currently airing really is true! You won't use near as many, so the value comes out the same. You might pay more for the Vista or Bounty, but the rolls last longer, so it all comes out in the wash. You might as well buy the good ones that feel more like a cloth. Steakhouse Grinder seasoning: This seasoning is my staple ingredient. I'm lost without it. I get a lot of compliments on my cooking, and while I know part of it is patience and experience, I'm fully aware that the steakhouse grinder adds the perfect flavor to chicken, steaks, fish, potatoes, carrots and dips. Clorox wipes: I won't even remotely consider reverting back to spray cleaners and rags again. I won't do it. I have spray cleaners on hand, but a Clorox wipe always does the job without bringing them out. For mirrors, Windex with newspaper, but otherwise, I want my Clorox wipes. Santa Clause is Comin' to Town! 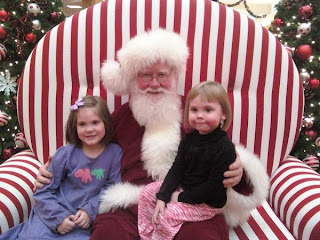 We were lucky enough to see the one and only, authentic Santa at the mall today. We only had a short visit, since he had to go feed Rudolph, but it was long enough for Miles to request, "a Moon Sand Castle, please," and for Lola to scream, "BOAT! I want a boat!!" I absolutely love this picture. Why do I complain internally on a daily basis about the yellowing of my teeth when I limit my effort to using "whitening" Crest? No more. Yesterday, I started using Listerine Whitening Pre-brush rinse twice a day. I will give a progress report in a couple of weeks! I do notice that the rinse makes brushing your teeth feel more productive, like it really loosens up any plaque or food between your teeth so that your teeth are super smooth after brushing. It sort of equates to if you flossed, brushed, flossed right in a row. The White Stripes "We're Going to be Friends"
Marvin Gaye "Thru the Grapevine"
Ben E King "Stand by Me"
Traveling Willberry's "End of the Line"
Tim McGraw "Red Rag Top"
The Gourds or Snoop Dogg's "Gin and Juice"
Phish "Birds of a Feather"
Johnny Cash "Folsom Prison Blues"
Otis Redding "These Arms of Mine"
Elton John "Yellow Brick Road"
So the previous post about Peggy Sue Got Married got me to thinking, and I decided to post a little about our wedding, since we've been married for seven years and counting now. Phillip and I were married on October 6, 2001 at Oakland's Historic House Museum in Murfreesboro. Our wedding was at 5PM, because I wanted a full meal at the reception and because I was hoping for a sunset wedding. I used the Farmers' Almanac to determine the sunset time, and it was wrong. However, we still had a lovely ceremony. We had bought glass lanterns that lined the walk from the little cabin to the mansion's front porch, and they were pretty useless, but they still looked neat. I wore a sleeveless, boat-neck ballgown and my bridesmaids wore black, which people thought was strange in 2001. I designed the dresses, and they were handmade; each girl wore a long jacket with a sleeveless top and long skirt...very Stevie Nicks. The groom and his groomsmen wore black tuxes with charcoal grey vests. The music that I chose for the time while people waited for the wedding to start was very unique for 2001. (Etta James, Frank Sinatra, Otis Redding, Madonna, Ben E. King, etc.) My bridesmaids walked in to "You Look Beautiful Tonight" by Frank Sinatra. My friend, Kathryn Fowler Stallins, sang "Grow Old with Me." My daddy gave me away and I gave him some sugar, a hug and said, "I love you, daddy!" Our preacher was Brother Luke, who I'd grown up with. He'd worked his way through Christmas one year at McDonald's while he'd been in LSU's doctorate program and had been a friend of my parents for many years. He called Phillip 'Raymond', which is Phil's middle name, numerous times throughout the ceremony. He later told my parent's that I was the happiest bride he'd ever married, and that this had made him really nervous. After the ceremony, Phil and I walked back down the aisle (amidst the bubbles that our guest blew) as husband and wife to Sinatra's "Fly Me to the Moon". We hopped into the limo waiting for us and were whisked down historic Maney Avenue towards the Stones River Country Club for our reception. After we arrived, we came into the ballroom to Stevie Wonder's "Isn't She Lovely" and were introduced as husband and wife. Our guest dined on house and caesar salad with rolls, corn, new potatoes, California mix, green bean almondine, lasagna and Jerusalem chicken. for dessert we had wedding cake and groom's cake but we also had Oreo Dreams and Cheesecake Toffee Bites. Our dj played lots of oldies but also some current (2001) goodies. Mrs. Judy Caffey led the Cowboy Cha-cha. It was a good time had by all. One of my two maids of honor, Mandy Caffey, gave a reminiscent toast before requesting/dedicating to me the anthem of our 6th grade year, "Push It," and my college bff/Rosewood Apartment # H-127 roommate/Chi-O sister, Anjeanetta caught the bouquet. Phil's friend, Patrick caught the garter. Casey was a groomsman and Franklin came into town for the big she-bang. Skylar, my niece, was our youngest attendee at five weeks old. We refused to do the thing were we left before it was over. We literally all helped carry gifts down to my daddy's Cadillac (they barely fit) and wished my parents a safe trip back to the house before heading back upstairs. We sat around a really big round table with our closest friends, had a beverage (or two) and talked about old times and the good times to come. The only regret that I have is that I didn't ask the dj to play "All my Rowdy Friends Have Settled Down" as we sat around that table. After a short time, Phillip and I decided to leave and we all walked out together. Our friends headed to Puffing Billy's while we headed to our honeymoon suite in Nashville. On Monday morning, we flew out of the country less than three weeks after 9/11. We were nervous, but we made it overseas and back just fine. And there you go...my wedding day...summed up in a simple blog post. Phillip and I are watching Peggy Sue Got Married tonight. If you aren't familiar with the plot line, Peggy Sue passes out at her 25th reunion and wakes up in high school again. This got me to thinking about what it will be like when I've been out 25 years. It has already been 15, so I guess it isn't too much of a stretch! For me, 25 years since graduation will be 2019. I will turn 43 that year, and Phil will turn 42. My kids will be turning 16 and 13 that year. I don't know yet what this country will be like, or what the cars will look like, or even which of my classmates will have passed away by then. I do know that I love my life and I can't wait to see what I'll be like at 43. I'm not so sure I'm ready to imagine Miles behind the wheel of some sporty little thing she gets for her 16th birthday, but then again, I do have nearly 11 years to prepare myself. I have to wonder, since we tend to see clothing styles come back into popularity, does that mean that in 2019, we'd be reviving the look of the mid to late '90's? I hope not, because I still regret those jean-cut velvet pants I wore on New Year's Eve 1996 (when Leigh Ann and I randomly flew to Tampa to ring in the new year; what were our parents thinking when they financed that shenanigan, I'll never know) and if you think for a second that I'll be reviving the looks that I wore out to fraternity parties at the old Sigma Chi, KA and SAE houses in said mid to late 90's, you have lost your ever-lovin' mind. Britnay Spears looked beautiful on stage with Madonna. She had her hair straightened and wore a beige ruffled tuxedo-style blouse with black silk trousers. Yay! I don't want her to be a train wreck. Lola put multiple pieces of chalk in my freshly opened can of Coke. Have you seen this train wreck of a show on MTV????? SAD. That's all I can say about it. It is sad. To think that those skanks think that they're actresses is sad. Had my head bashed in on the left area on my forehead three times within 10 minutes while I tried to settle Lo-Lo down for a nap. Had my nose rammed (three times) so hard I thought it was going to be bloody while I tried to settle Lo-Lo down for a nap. Had Lola dump a container of "grassy knoll" green paint all over the wood floor in our kitchen plus the freshly painted kitchen table (this is an old *possibly antique table*) my parents gave me. Had Miles scream at me for telling her no when she wanted to hear yes. Managed to complete voting AND Kroger. Cleaned the kitchen and breakfast nook- BIG TIME! Cooked tacos for dinner with two children clammering all over me. Had a friend over to watch election coverage. Disclaimer: I love my boo-boo's more than anything, even if they drive me batty most days. The election...my headline sums it up. 30-something artist and stay-at-home mom to my girls, the big girl magnet school kindergartner, Miles (6), and the wild child pumpkin-head, Lola (almost 4); dedicated station wagon owner; reading addict; celebrity gossip junkie; magical boo-boo healer; aspiring gourmet cook, future novelist; wife to a creative genius and best friend to the strongest woman I know besides my mother. Can I suggest a site hosting company? I tried numerous hosting companies for my website. If you need a site with hosting, please seriously consider Start Logic. The interface is very user-friendly, the customer service is based in the US with knowledgeable staff and you just get more for your money than other companies.